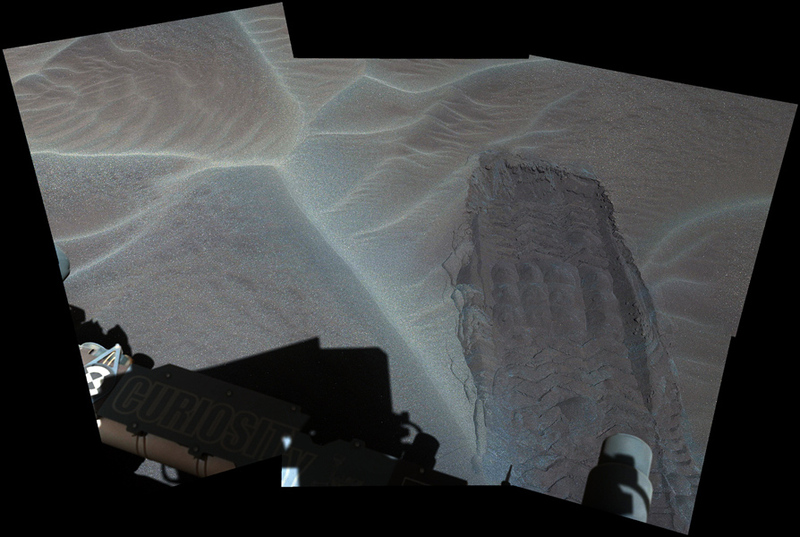 The first up-close look at Martian sand dunes is being done by the Curiosity rover. This marks the first time that active dunes on another planet have ever been investigated. The “Bagnold Dunes” are found at Mount Sharp’s northwestern edge. Some are two stories high, and they’re quite active. Satellite imagery shows the dunes being shifted by the Martian winds by near 1 meter (3 feet) each year. Curiosity’s arrival at the dunes is a first for all of space exploration. “No active dunes have been visited anywhere in the solar system besides Earth,” NASA stated in a press release. The images that are included in the above mosaic were originally taken on Nov. 27, 2015; however, it takes some time for NASA to receive and edit the images, which is why we are just getting them now. NASA notes that, in this case, the scene is presented with a color adjustment that is meant to approximate white balancing and resemble how the sand would appear under daytime lighting conditions on Earth. Ultimately, Curiosity has been at work on Mars for 1,176th Martian days. Curiosity’s primary objective right now is to explore Mount Sharp. Just as Earth’s layered sediments provide a window into the past, scientists are hoping the layers of Mount Sharp will provide some insight into Mars’ geological history. Learn more about this missions in the video below. In the end, ascending and exploring the sedimentary lower layers of Mount Sharp, which towers some 5.5 km (3.4 miles) into the Martian sky, is the primary goal of the rover’s mission on the Red Planet. That said, multiple NASA rovers have studied much smaller Martian sand ripples on the planet (including the Curosity rover); however, none has ever visited or investigated these types of large dunes, which are as tall as a two story building and are as wide as a football field. Science Explained: What Causes the Bright Spots on Ceres?